Gazelle - J.C. Lind Bike Co.
Gazelle (given the title Royal Dutch Gazelle by Princess Margriet in 1992) is the renowned leader in Dutch bike manufacturing since 1892. Their factory in Dieren produces over 250,000 bikes a year. From their conception to the present day, they've focused on making comfortable, safe, and stylish bikes that can be depended on daily. Their bikes almost entirely feature an upright riding position, a stable ride that's as comfortable on the freshest, newly paved bike path as it is on ancient cobblestones. Gazelle continues to manufacture the perennially relevant Tour Populair model, which harkens back to their gloried past. They also build all types of modern bikes including eBikes, for a multitude of uses. Gazelle's storied history continues, and we're along for the ride. The Gazelle Medeo is an upright, step through, comfortable 9-speed pedal assist eBike with a Bosch mid-motor. 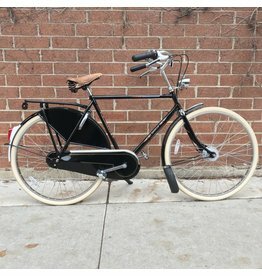 A timeless Dutch bicycle from a storied Dutch bike company. 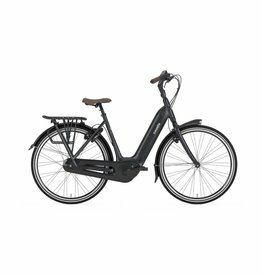 The Tour Populair is upright, stylish, and made for city riding. The Gazelle Arroyo Elite is a state-of-the-art eBike with a Bosch mid-motor and Bosch's seamlessly integrated Powertube 500 Wh battery. 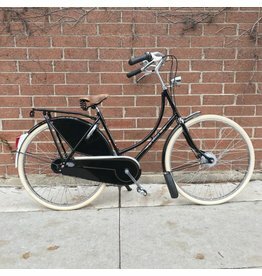 A timeless Dutch bicycle from a storied Dutch bike company. 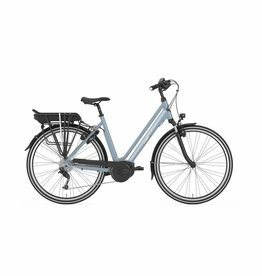 The Tour Populair is upright, stylish, and made for dependable city riding.